This is a short story with pictures and complementing texts that is based on a new Finnish book (available 27.10.2011). 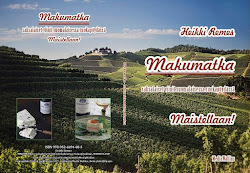 Maistuu viinien kanssa - Chile (Tastes with wines- Chile) book has 40 chapters and first there is background information about Chilean wines. Main part of the book consists briefly the wine valleys in Chile, their characteristics. Then there are 4-5 different food recipes for wines in each Valleys. Wines that are made of different and familiar grapes of different areas are combined with suitable Nordic food. So, hola wine friends! Welcome to our wine trip to Chile. Chilean horsemen, huasos, lead us towards the vineyards in Aconcagua Valley. We are heading towards northern part of wine areas in Chile. We are in Limari, nearly 400 kilometers from Santiago. Landscape is rugged, vines will find place on river beds and on slopes of the mountains. Here we are in Puente Alto in Metropolitan area near Santiago. Here we can see how quality wine is made. There are three separate groups on line sorting grapes that will be used for premium wines. Very interesting and educational is to learn how Centro de Aromas helps wine producers to plant and use different grapes. This is one of reasons behind rise of the quality wines in Chile. 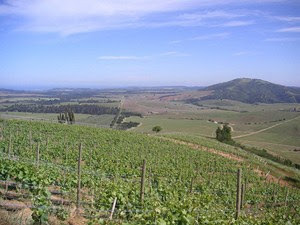 Colchagua Valley is nearly 100 kilometers south of Santiago. Closer to the autumn mornings are usually misty, but quite soon sun and warm evaporates clouds. Grapes turns dry are ready for picking. One of the highlights is to taste tank sample during a visit to winery. One can feel the real youth of young wine and its origins. Baked potato is easy, familiar and tasteful dish. It gives opportunity to taste different kind of wines according to the fillings, eg. vegetables, fish or meat. Tourism plays bigger and bigger part on wine business. So also luch is served with an elegant style. In Bío Bío area wine traveler meets areas where new vineyards and plantations stretches as far as the eye can see. Future is here growing! Wine producers in Chile are seeking proper and best soils and microclimates, where wines will express terroir and profiles of the grapes. Detailed chart helps to decide and plan where to plant the vines and how. Calicatas are holes in the land that verifies the structure of the soil and helps in planning the chart over the area. Chile has 14 wine valleys throughout the whole wine area. Most important for a single wine valley and its vineyard is its transversal location from east to west, not from north to south. And there are three different climatic areas between coast and Andes; Coast, Entre Cordilleras, Andes. Leyda is situated on coastal area where grapes become fresh and have nuances. The wines are therefore aromatic and fruity. Salmon that has been made on a ice cellar way has fresh taste and tastes with Chardonnay. Near the Andes the fluctuation with temperatures between day and night are big. In the evening cold air descends from Andes and during the day temperatures gets very high. This helps grapes to achieve structure and aromatic flavors. Carmenère is round, medium sized and dark grape, that is very fruity and full of aromas. Its juice is soft, jammy and has aromas of forest berries. Near the harvest time Carmenere’s leaves turns from green to red. It indicates that grapes will be ready for picking. Only totally ripe grapes are picked and they are separated with a rope from not mature grapes. Wine trip in Chile has emotional response when you wake up early before sunrise and vineyards are still covered by mist. It forecasts new and enjoyable day with the wines. Late Harvest has a minor part during Chilean wines, but it has great impact during tastes. It tastes by itself, but its delicate and aromatic aromas matches with chocolate cake and actually crowns the dessert. Ps. If you want to comment, please click the headline and write your thoughts to the box at the end. Hei. Mukava kuulla että pidit kirjasta ja kiitos kannustuksesta. Nyt kirja lähti painoon ja se ilmestyy juuri Helsingin Kirjamessujen alla lokakuun lopulla. H.
Hei Heikki, kiitos kirjasta, oli hieno lahja! Kivasti kirjoitettu, huippukuvia! Hienoa, että kirja miellyttää. Nyt on aika startata uusi vuosi kevyesti ja kestävän kehityksen otteella. Viinimaailmassa, kuten tiedät, on palattu juurille, jossa luomu on kova sana. H.